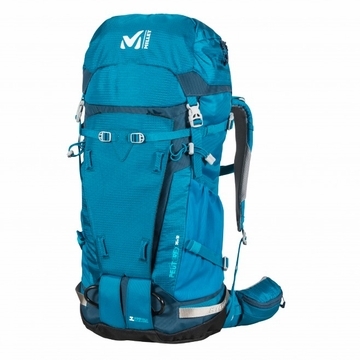 This pack is tailored to women's form, and is very comfortable to carry. Free Flex gives tremendous freedom of movement, and the pack has a very special build. T he shoulder straps are attached on both sides, and perfectly follow the female carrier's bodyshape - that's a real plus-point."" The carry system's shoulder straps are of wide, ""wraparound"" design, but also highly ventilated. The hip belt is also well ventilated by large ""gills"", making the PEUTEREY INTEGRAL 35+10 LD a pack for all seasons. The direct access to the main compartment is made easier by a side vertical zip. Popular for: - its crampon pocket - its ruggedness - its FPP ice axe holding system - its feminine look with specific materials and highly elegant detailing (like the attractive ski holder) - the build of its shoulder straps - and its expandable lid.